I haven't blogged in way too long! I'm having too much fun over on Instagram. If you want to follow along to see what I've been up to, I'm @LoganQuilts. 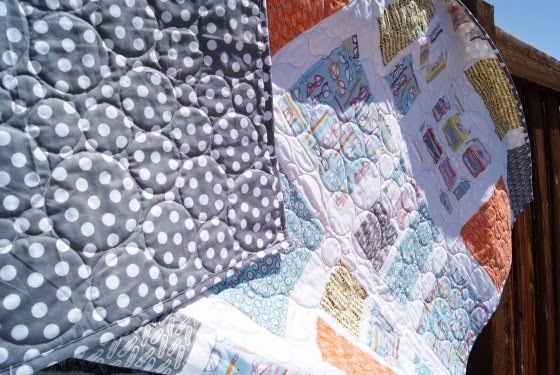 Right now, I'm loving the Lollies quilt-along that's going on over there. 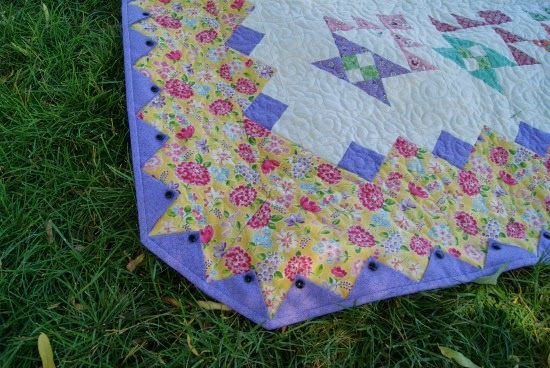 The Lollies quilt is one of Camille Roskelley's newest patterns, and it's one of my favorites. I've posted a few pictures of my progress, but I'm still not done. 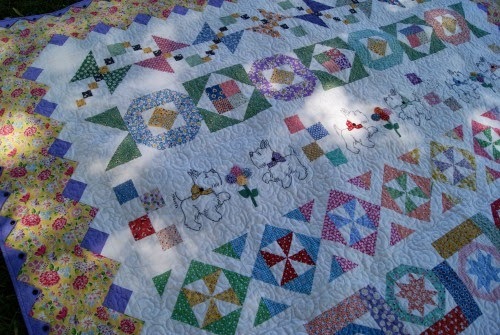 I need to put the borders on and get it quilted. I'm using Summer Celebrations fabric from Riley Blake and am so excited how it's coming together. 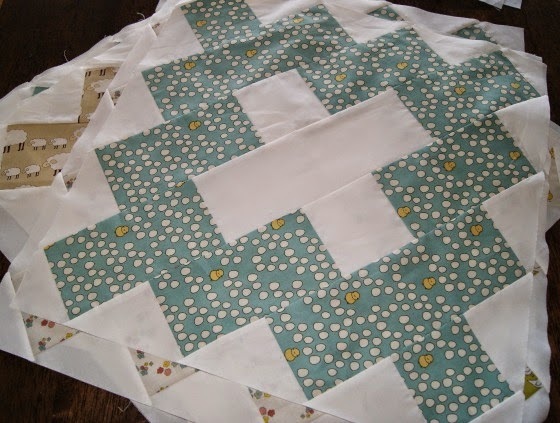 It will be the perfect summery picnic quilt. 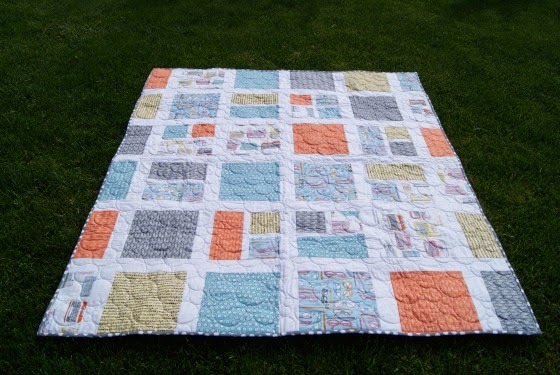 Because I'm having so much fun seeing everyone else's version of this quilt, I am offering 25% off any edge to edge quilting design on your Lollies Quilt until June 30th. 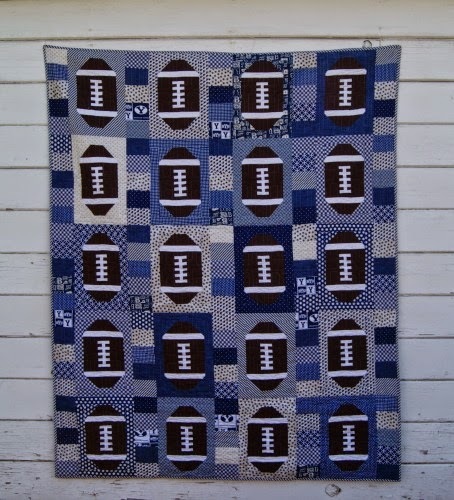 A few months ago, I saw this quilt pattern called Touchdown by Cluck Cluck Sew and I knew I had to make it. To say my husband is a huge sports fanatic would be an understatement, ha! Plus, with all the quilting I do, I've never actually made him a quilt of his own. So I figured it was about time and this was the perfect one for him. I did it up in BYU blues since that's one of his most favorite teams. Make sure to check out all the amazing entries on Rach's blog. And don't worry, if I don't make it to the top 16, I'll still be rooting for some of my other favorites from the sidelines! 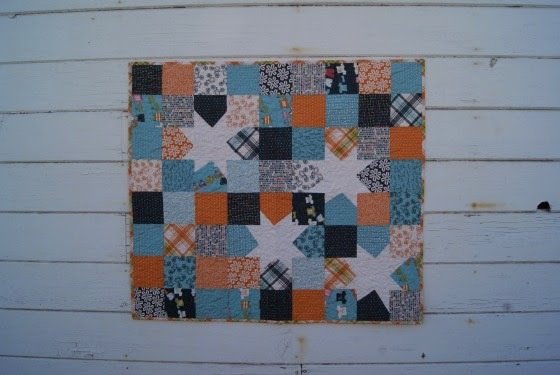 This quilt has been on our blog before, you can read all about it here. 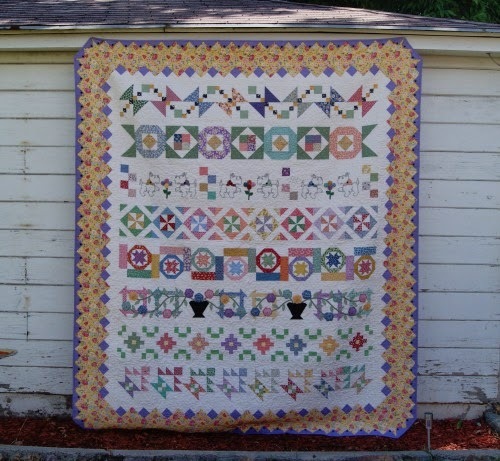 It is one of my most favorite quilts because of its different patterns within the quilt and it bright cheery colors. It was sew fun to make. I am posting this quilt again because I am entering it in the first round of the Sewvivor Quilt Contest which entries close tomorrow. 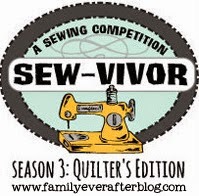 You can read about the contest and see all different entries at Family Ever After. A while back Kimberly from Robot Mom Sews asked if I would be willing to test out a pattern for her. Of course, I said yes! I think she did a great job with her pattern cover. She also did a great job writing this pattern. 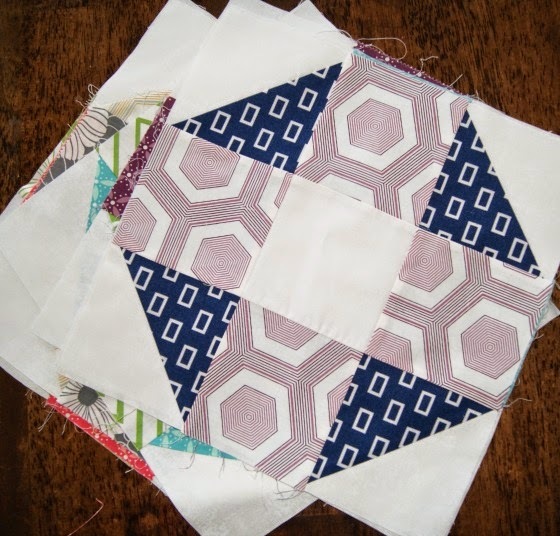 It's so easy to follow and would be perfect for a beginner or someone who wants to showcase some of their favorite fabrics. 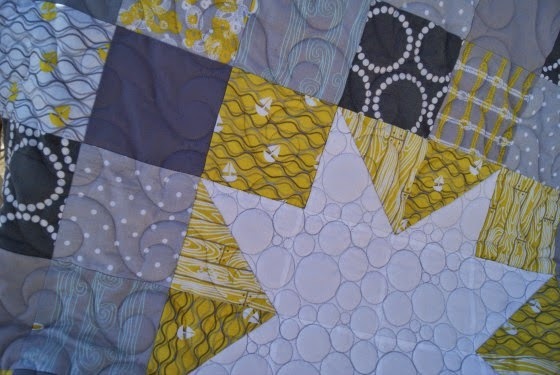 Because the blocks are big, I decided to use up some of my Type by Julia Rothman fabrics that I had been hoarding to show off these big prints. 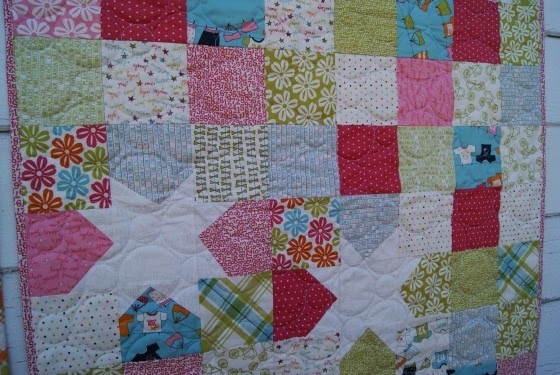 I went with some bubble quilting and of course, had to use polkadots for the backing. 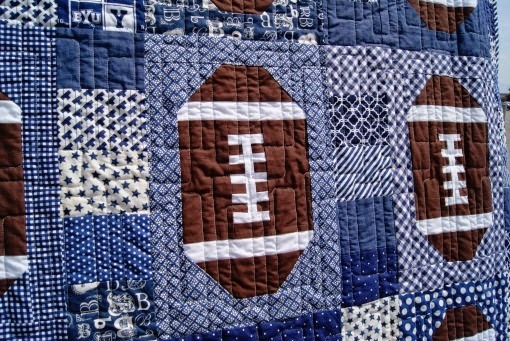 The quilt measures 59 x 68, so it's a perfect size to cuddle up with on the couch. 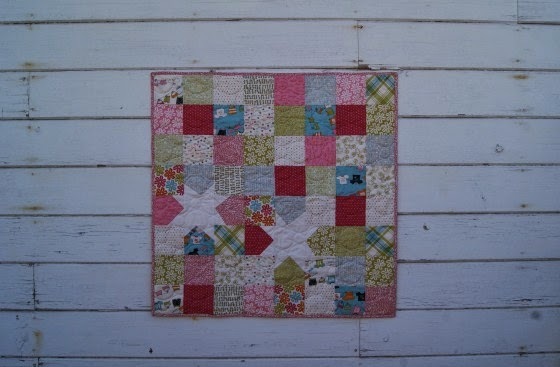 I decided to list this quilt in my Etsy shop. But if you want the pattern to make your own version, head over to Robot Mom Sews today. 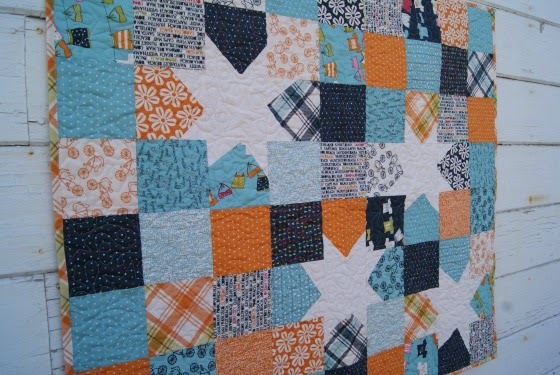 I'm linking up with Quilt Story, Sugarbee Crafts & Blossom Heart Quilts. 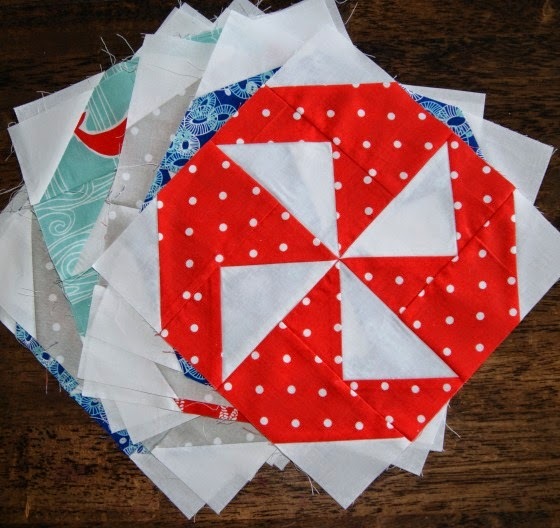 Last year when I was doing The Simply Retro Quilt Along with Jana, it was moving so fast that on some of the quilts it was all I could do to get one or two blocks done. So I have been slowly working on finishing up the last of them. It seems like they are moving sooo slow because I usually only work on them in between all my other WIP's. Ha! I need to have some finishes soon! This one is Dapper. I have all the blocks but three done for this one, so fingers crossed, it will be finished up soon too! Playground. 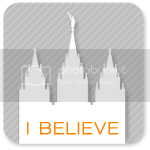 I only have just a few blocks done here but I'm really liking how it's coming together. This last one is called Fresh. Honestly, it's not a favorite. Probably because I am wishing I would have done it in different fabric. 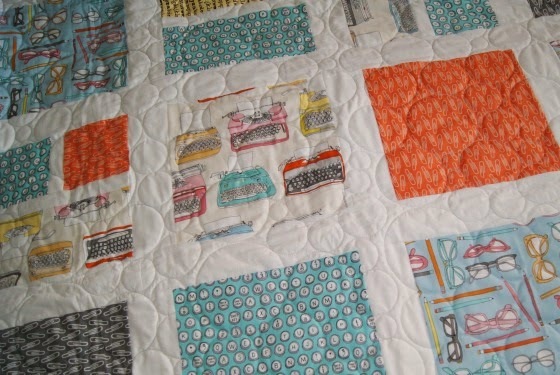 As much as I love this Lori Holt fabric, it just wasn't cut out for a bed spread quilt. This pattern makes a huge quilt and even though I've already cut out all of the fabric I'm thinking I might just make these into a baby size or something and use the rest of the cut fabric for something else. I'm not sure. So if you have any suggestions, let me know! Of course, I've been holding on to this darling Lucy's Crab Shack fabric for a while. Because it's just so darn cute, I kept waiting for the perfect project to use it on. Finally one night I just yanked it down from my shelf and went to work with no actual pattern in mind. Midway through, I got the idea to make some wonky stars out of the white number fabric that came in the line. And of course to separate the colors. I couldn't have planned it better! I just love the way they came together. 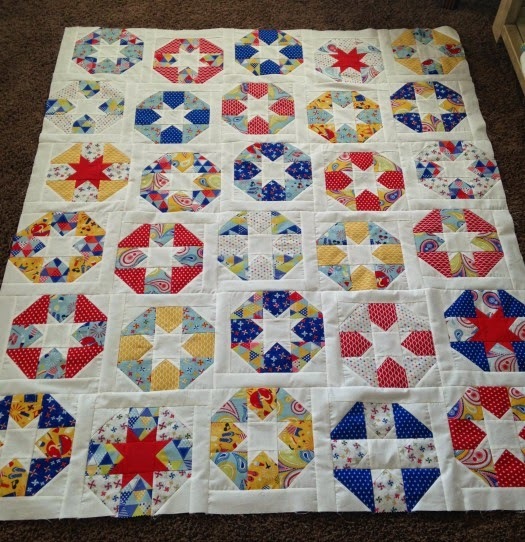 For the boy version, I quilted it using a small loopy star pattern. It measures 40.5" x 35.5". For the girl version, I quilted bubbles. This one is just a bit smaller than the other one, measuring 35.5" x 35.5". 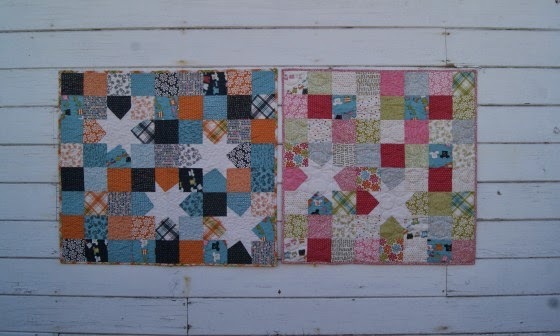 These quilts are for sale in my ETSY shop. Lauren from Charlotte's Grace for a Cure's auction finished up on Saturday, raising over $4,100 for The Pediatric Brain Tumor Foundation! Isn't that so great?! We were lucky enough to be a small part of it by donating two quilts of our own and quilting these two quilts that Lauren and her friend Tracy pieced. The quilt above is titled Maritime Modern. 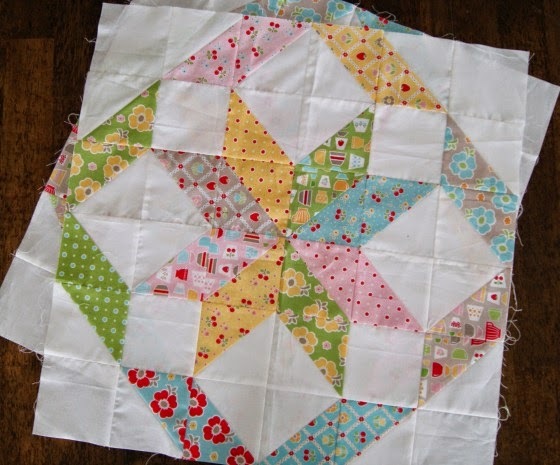 We quilted it with bubbles in the star and waves through out the rest of the quilt. Darling for a sweet baby. 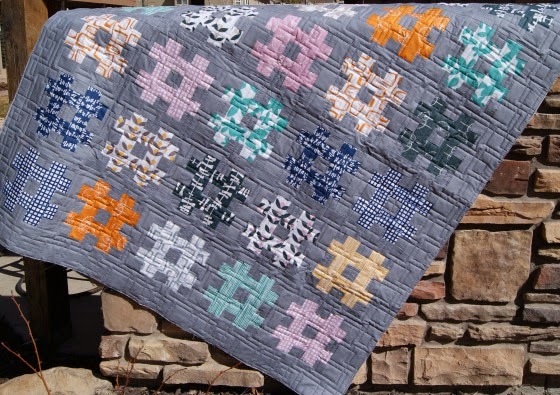 The Hashtag quilt below uses the Glimma fabric line and was quilted with a "square dance" pattern. 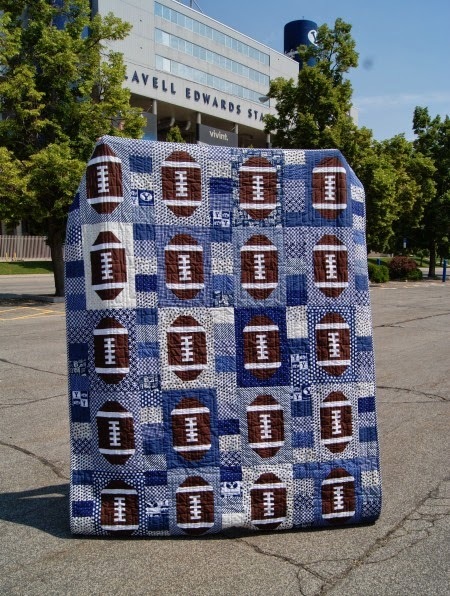 Both of these quilts are fantastic. I think it is just so amazing that Lauren, a busy mom of 4 and caretaker of three year old daughter Charlotte who has cancer, has been able to turn her hobby into an amazing fundraiser that will benefit so many! If you don't already follow her blog, Charlotte's Grace for a Cure, you should! 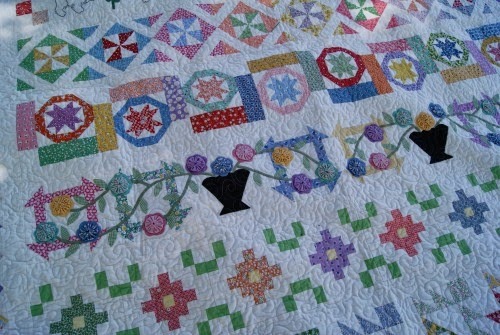 She shows of great quilts and her darling family. 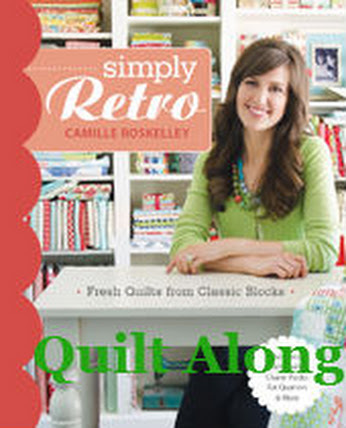 I love this awesome quilty community that we're all part of!